The brand-new facility allows for a modern learning experience and is an example for schools across the country. 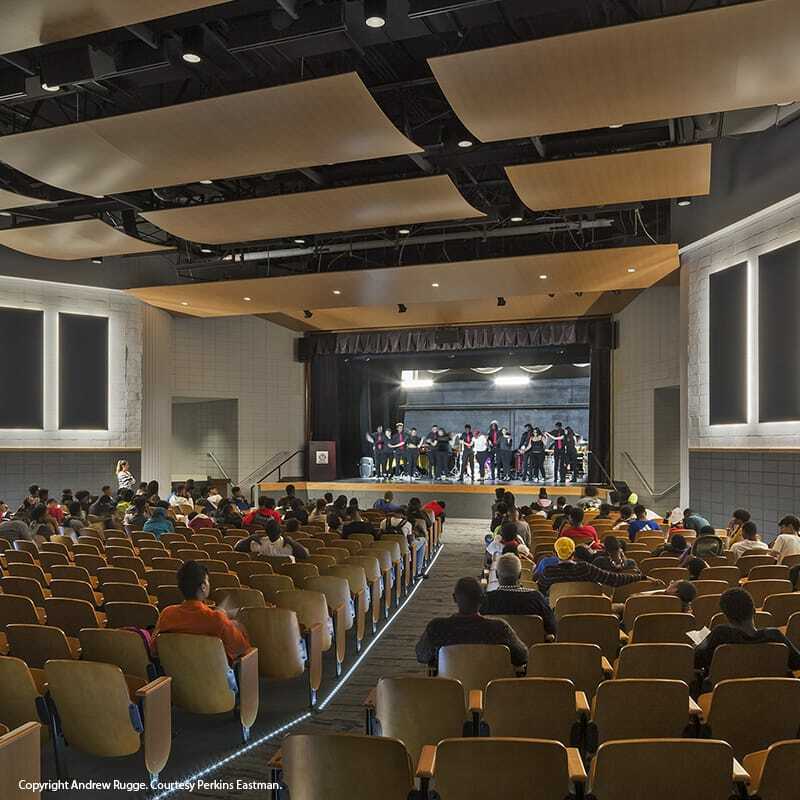 Gilbane and Perkins Eastman DC (PEDC) recently completed the $62 million, design-build Ron Brown College Preparatory High School (RBHS). This school is the first all-male public high school in the District of Columbia. RBHS provides a student-centered, college preparatory curriculum that develops and enhances character, academic curiosity and service. The newly renovated school is 181,541 square feet and designed for 600 students. Its design features a revitalized central library that serves as the “heart” of the modernized school and a new Fraternity Hall commons that acts as its “soul.” The renovation also added a new entrance pavilion that provides a stronger civic presence to the neighborhood. 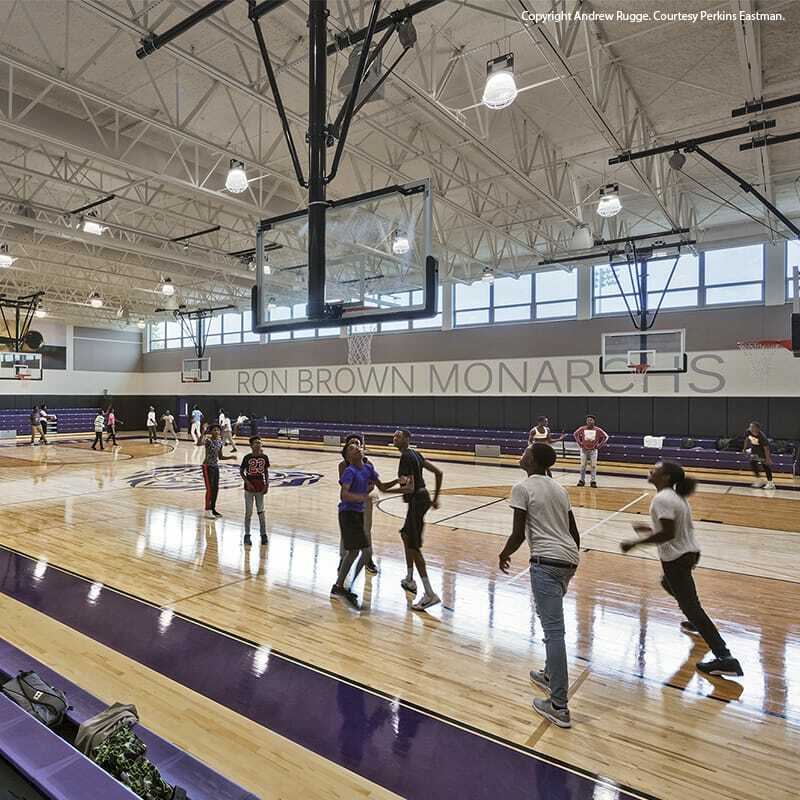 A true fast-track project, the RBHS project was delivered from program of requirements through substantial completion in just 20 months, with a construction schedule that delivered $62 million in construction in 16 months. The project scope included the abatement, interior demolition and renovation of the building in two phases. Phase one, which broke ground in the spring of 2016 and opened in August of the same year, involved modernizing the entire first floor of the complex. Renovations included an updated main entrance, new main office and administrative suite, enlarged library, multiple classrooms and labs, music room, kitchen, cafeteria, and multi-purpose space. Phase two, which opened in August 2017, included renovations of the second and third floors, the existing auditorium and the gymnasium. Phase two was delivered while the high school remained occupied and fully operational. 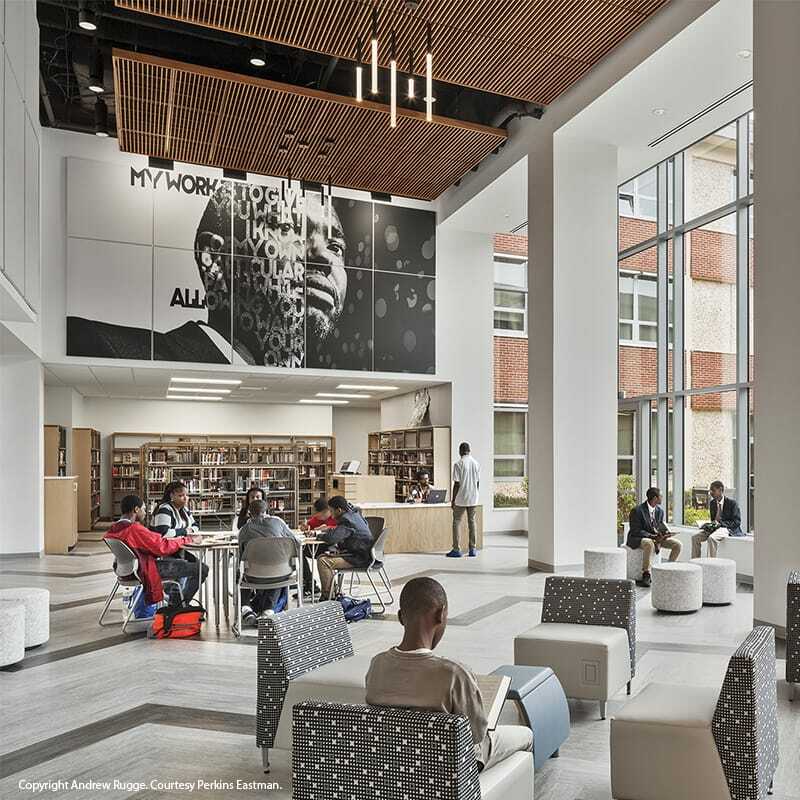 To support the surrounding Ward 7 community, Gilbane set up a “hub” at the Dorothy A. Height Benning Library to meet with local and disadvantaged subcontractors, suppliers and service providers interested in working on the modernization. Our outreach team met one-on-one with business owners to introduce the project and explore partnership opportunities. Over the course of a month, the team held eight targeted sessions that accommodated 21 different companies from electrical and underground utility trades to janitorial services and catering companies. The efforts connected trades with Gilbane’s prequalification process for future and current work as well as connecting the trades with prime contractors. With the help of the Ward 7 Business Partnership these outreach efforts reached dozens of small businesses located in Ward 7. The Central D.C. Mission provided janitorial services to the project, Jewel Landscape performed landscaping and Armstrong Custom Signs produced the project signage around the site. Ultimately, Gilbane awarded $48 million in CBE contracts and hired 47 Ward 7 residents. Local news coverage by NBC Washington. Gilbane provided full preconstruction services in a streamlined, fast-track format. A key priority for our client was maintaining design intent and quality through GMP, and reducing substitutions that might degrade overall quality of finishes. The co-located design-build team worked diligently throughout our value analysis process to balance cost efficiencies with owner priorities.